Pink bridesmaid dresses are one of the most classic color schemes for bridesmaid dresses. Pink is such a rosy and feminine color, and a natural and romantic choice for wedding party attire. This is our shopping guide about where to find the latest blush and pink bridesmaid dresses for weddings! Bridesmaid dresses in pink can range from a barely-there blush, to a dusty rose, to a vibrant hot pink, with many beautiful hues in between! 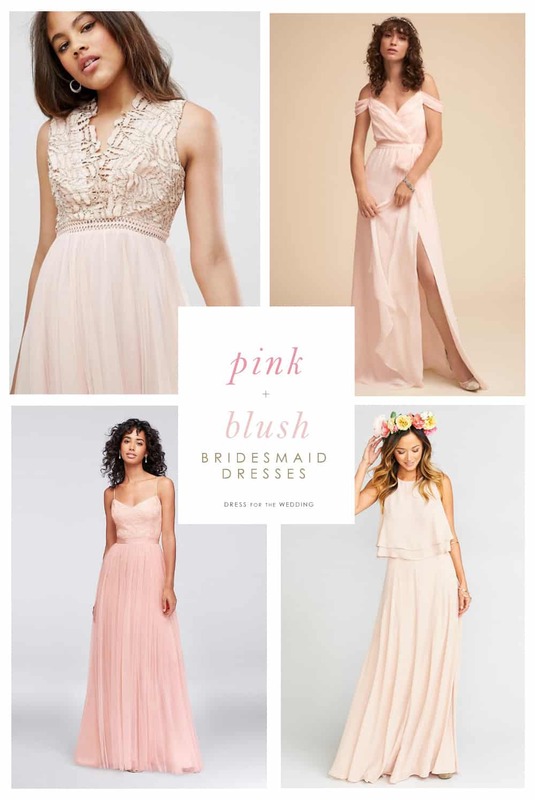 Here are some of my favorite pink dresses for bridesmaids in shoppable format! Shop section uses sponsored links. Nordstrom: Top styles in pink and blush from Adrianna Papell, Hayley Paige Ocassions, Jenny Yoo, makes it easy to buy online and ship anywhere your bridal party might live! Adrianna Papell: Hands down, our favorite place to get sequined, beaded blush, pink, or rose gold bridesmaid dresses! If you want a glam look, this is the place! BHLDN: The most perfect curate collection of stylish bridesmaid dresses, with great customer service! Show Me Your Mumu: If you want a boho, easy style try Show Me Your Mumu! We love these dresses and think your bridal party will too! Try Antique Rose Chiffon, or Dusty Blush Crisp, or Magic Mauve for a bit of glimmer! ASOS: Affordable and on-trend options with many styles under $150, Check out Maya and TFNC. These dresses sell out quickly so if you see one you like! Go for it! Azazie: Another great option for getting lots of different styles and silhouettes in one uniform color! Azazie has several shades of pink, and so many fits to choose from – plus they are made to order – no alterations needed! Very affordable too! Lots of styles under $100! So, if pink or blush is your wedding color scheme, you might be interested to see our styling ideas for bridesmaid dresses, our picks for Pink Mother of the Bride Dresses and Wedding Dresses!